As you would expect from the smallest light on test, the Kick has the lowest lux reading of any of the lights here, at 260 at 1m. However, this light boasts the most impressive functionality. With its own built-in Wi-Fi signal, users can connect to the Kick using their smartphone or tablet via an Android or iOS device. Not only can brightness and colour temperature be controlled from inside the accompanying app, but the Kick can also sample colour from the scene through the camera of a connected device and output any colour of light. In addition, the Kick features a special-effects mode, which, among other things, includes strobe effects and a rainbow mode that cycles through all the colours. The Rift Labs Kick is designed to slide onto an iPhone, although it can be used just as well as a separate unit alongside Android devices. A tripod mount is included. Petite and solid with the kind of quality finish you’d expect from a high-end Metz flashgun, the Mecalight LED-480 is the smallest panel tested here, with the exception of the specialist Rift Labs Kick light. It sits comfortably on a DSLR hotshoe, doing little to upset the balance. The magnetic snap-on diffuser and filter are a brilliant feature, and additional gel filters can be sandwiched in with ease. Light control is by a single stepless rotary knob, allowing continuous variation of intensity. I like the inclusion of a tripod bush socket on three sides, which is very useful when positioning the light in macro set-ups and allows the LED-480 to be attached to the smaller Mecalight LED-160 models to create a larger, adaptable three-panel lighting array. Light intensity is impressive for the LED-480’s size, and with a diffuser in place it gives even coverage with no hotspots. 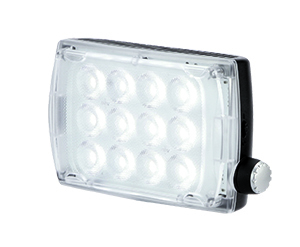 As well as being a good main light, it is excellent as a second source in confined sets. A gargantuan offering from Manfrotto, this 1x1ft panel with bicolour LEDs can provide a continuously variable colour temperature from 3,200K-5,600K. 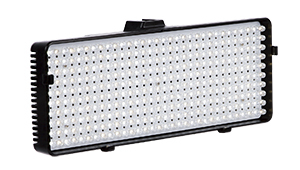 Even with the vast quantity of LEDs in the array, it is silent and heat-free in operation. Clearly designed as a stand-mounted light source, the yoke attachment provides good balance and easy angle adjustment. On close inspection, it appears that Manfrotto has thought of everything, including modular fittings that unclip for cleaning, light shapers and filters that are easily attached, and the all-important colour-rendering index of more than 90 enables accurate colour reproduction. The range also includes a Spectra 1×1 S flood (1,400 lux) and a Spectra 1×1 S spot (1,700 lux), which offer a narrow and wideangle version of this panel, so all lighting requirements are covered. The build quality and design are superb, and although the cost is undeniably considerable, it would would make the shortlist for a lighting rig in a serious film and televisual production. Litepanels is an specialist lighting company based in California, USA, where many of the products are designed and assembled. The Luma is a high-quality, solidly built product that has a plastic outer body. Included in the kit is a heavy-duty carry case, a metal ball head with hotshoe-to-tripod fittings and light modifiers. 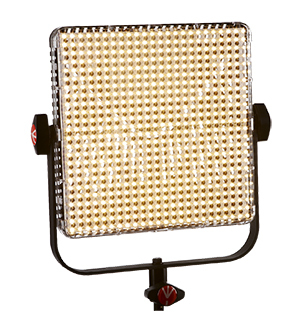 These modifiers include two orange gels for balancing the colour temperature and a diffusion gel, with each inserted into a small gap between the plastic front and the LED bulbs. Overall, the Luma is the highest-quality light on test here. Interfit’s substantial LED light panel boasts 160 orange and 160 blue LEDs in its array, allowing for a colour temperature range of 3,200K-5,600K. A separate stepless control adjusts overall light intensity. The powerful panel is equivalent to 200W of incandescent light, or a light intensity of 1,500 lux at 1m. The colour temperature controls are disappointing. The total range is 2,400K, but there are 30 clicked steps to the adjuster, meaning that the increments don’t equate to 100K. This makes accurate adjustment difficult. Also, the supplied swivel ball-and-socket hotshoe mount can’t support the light securely on a camera. Two or more lights can be stacked together to create a large area of light, but they need to be stand-mounted due to the extra weight. 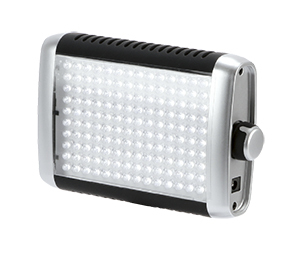 Manfrotto, while better known for its tripods, also has a range of LED lights. The Manfrotto Spectra 500F is new for 2014. 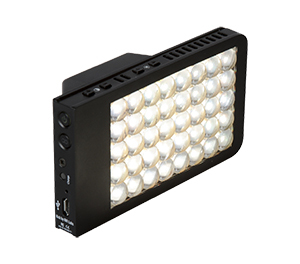 It is a portable, hotshoe-mounted LED panel clearly designed for professional film and video production. A great feature is the battery gauge with traffic-light colours: green for full power; amber when at 50%; and red when almost exhausted. Colour rendition matches Manfrotto’s Spectra 1×1 FT, so colour reproduction and skin tones are accurate and natural.